Don’t ask me why, but I’m a sucker for a title with a double meaning! Usually, though, they represent a pretty ordinary film, play or novel. 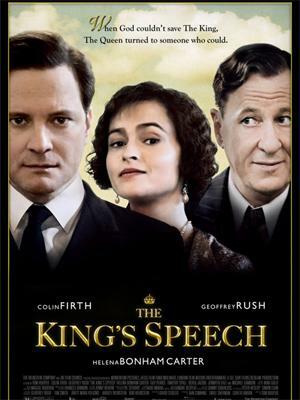 In the case of The King’s Speech, the film is far more clever than its title. Set in 1930s England, with the world on the brink of war, this is the story of an unfortunate chap with a speech impediment. Not a particularly big deal, perhaps, unless the unfortunate chap happens to be the king of a constitutional monarchy in which the only useful thing a king does is to speak to his subjects. In such circumstances, there is only one thing for it; run through the gamut of speech pathologists until you find one who has a bit of common sense. Such a personage, of course, would have to be an Australian. You just can’t make stuff like this up! It’s true. The film, I mean; it’s a true story. And it’s not in any way dry or sombre or mundane as biographical films are prone to being; it’s a thoroughly engaging story, made all the more real by its heart-warming depiction of our queen in her childhood, her mother in her prime, and the relationships of this extraordinary family. If you’ve not seen it, do so. If you don’t like it, you’re probably not human.